Here in my neck of the woods, we’ve had quite a bit of snow already. Since the last few Decembers in Southeastern New Hampshire have been mostly snow-free with fairly moderate temperatures, the cold and snow so far this month have taken a little getting used to – and my “Christmas Project” photo shoots have been more challenging. Still, while I’ve had to abort some shoots and reschedule others, it’s been a productive month so far. Since I prefer to work during that narrow window after the sun goes down but before the sky loses all color, there is but one opportunity each time to make a photo. Sometimes, though, the location and composition dictate going with a black sky instead. 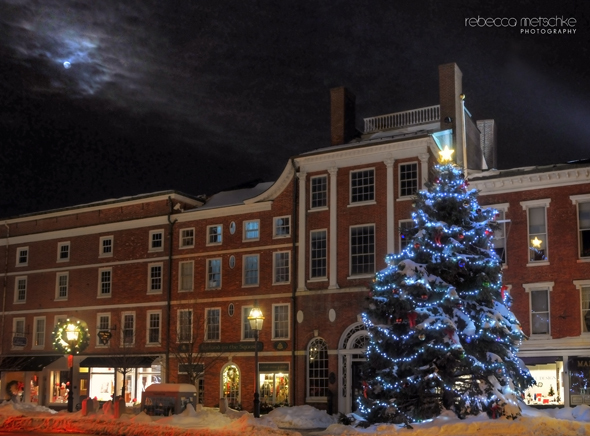 For example: one shot I had in mind involved the Market Square Christmas tree in downtown Portsmouth, but I didn’t want cars or people in the frame. That meant either a session late at night or at dawn. Into Portsmouth I went last night, in search of that photo. No such luck. I returned this morning about 2 hours before the sun was to come up for another try. The streets were mostly empty, but I wasn’t able to make the photo I envisioned. I found a fallback composition which, while usable, wasn’t particularly unique. After working for about 45 minutes, I made a circle around the block near the lovely North Church…and ended up right back where I’d started. Glancing up, I noticed that the nearly full moon had just popped through the heavy overcast. I quickly got set up and was able to take 3 shots before the clouds thickened once again. Had there been more time, I’d have happily done a lot more. Sometimes the moments are fleeting, though – and I remind myself to appreciate the chance I got.